Bowness Road N.W., between 70 Street N.W. and Shouldice Bridge, is scheduled for re-paving in 2017. This work presents an opportunity to cost-effectively improve the current road design so it functions better for all road users. Street improvement can enhance vibrancy along the main street and improve the pedestrian and cycling environment, as well as reduce speeding and shortcutting. In 2015 and 2016, The City met twice with community stakeholders and three times with the Business Revitalization Zone to develop an improvement plan. 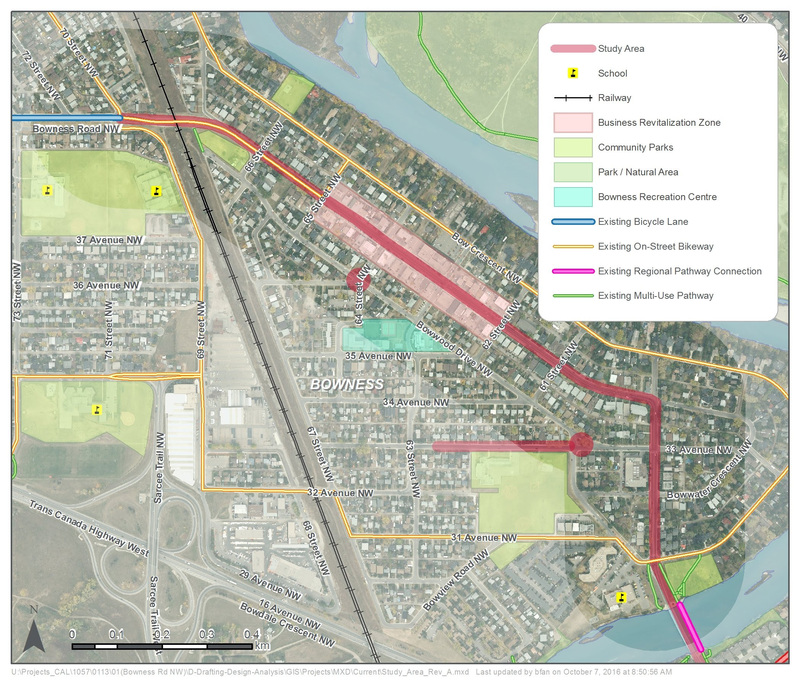 The public is invited to a workshop to learn about the project and provide feedback on intersection design options, proposed parking changes, pedestrian, pathway and streetscape improvements and bicycle facilities. Bowwood Drive N.W. and 33 Avenue N.W. The work on Bowness Road N.W. also provides an opportunity to save costs on adjacent improvements that would resolve community concerns. The intersections of Bowwood Drive / 36 Avenue / 64 Street N.W. and Bowwood Drive / 33 Avenue N.W. have been identified to be reconfigured to improve safety. Speed humps are also planned on 33 Avenue N.W. near River Valley School to reduce speeding in the playground zone. The project team will give a short presentation before beginning small group discussions. Each table will have one technical expert and one facilitator to provide an overview about the project, answer questions and lead discussions. Participants will be asked to fill out a feedback form after each topic is discussed. Two identical sessions are being offered at 5 p.m. and 7:30 p.m. Please RSVP byOctober 20, 2016 for the session you would like to attend. You can also RSVP by calling 311. If you are unable to attend either session, you can view the presentation and provide your feedback at calgary.ca/bikeprojects from October 25 – November 7, 2016. An input summary from the workshop will be posted online in early 2017. For more information about the project please visit calgary.ca/bikeprojects.